Movies of my Yesterdays is an irregular series where instead of writing about a movie I’ve never seen, I choose a movie important to my past and discuss why that is. I clearly remember that the first time I saw this movie, it was on a New Year’s Eve at home. It was one of the rare movies we had on hand that wasn’t made for children, didn’t even look like it was for kids, and wasn’t Star Trek (The only other one that comes to mind is Trading Places, which is very not for kids.) I don’t remember how old I was at the time, but I must have been in middle school or close to it, because I was staying up for midnight and my parents put this on for us. It must have been on the basis of how much I enjoyed the movie that first time, because I remember nothing else about that particular New Year’s, but watching the movie was so formative for me that I recall it every New Year’s Eve, and I’m always pleased when I have a chance to include the movie or the game in a New Year’s now. A few months or years later I developed an obsession with Back to the Future, and the fact that Christopher Lloyd has a prominent role here deepened my appreciation of this movie. I also think this is most of the reason Martin Mull makes me happy whenever I see him pop up in something. Tim Curry is of course, simply a legend. I can probably make a list of all the movies he makes better, but that would be a needless digression (and it’s probably “everything he’s been in except Rocky Horror” anyway). As anyone who’s seen the movie probably knows, what makes Clue particularly unique is the multiple-choice ending. I never got to experience the buzz when it was released, where different theaters got different endings and I don’t think it was announced there would be differences, but home releases on tape include all three endings and releases on disc have the option to play one at random. I do have a favorite, but I find it interesting that the linear version declares only one of them to be “the real one”. I think I’ve heard that it’s the only one that actually lines up with all the details, but I’m not sure if that’s true. There are too many subtle moments to keep track of. Regardless, it’s a fascinatingly unorthodox approach to storytelling. I’m not sure if I’ve played this movie since college, but it’s never been one I got tired of. By now I can recognize that, in concert with the amazing wit in the dialogue, one of the biggest strengths on display is that the script supports a large ensemble with fantastic characterization for everyone involved without giving too much focus to any one of them. It’s like an English high society detective novel without the high society or the detective, just a bunch of people being nasty to each other while trying to solve a puzzle. Lovely mansion though. Over thirty years later, this continues to be the paragon of game to film adaptations. 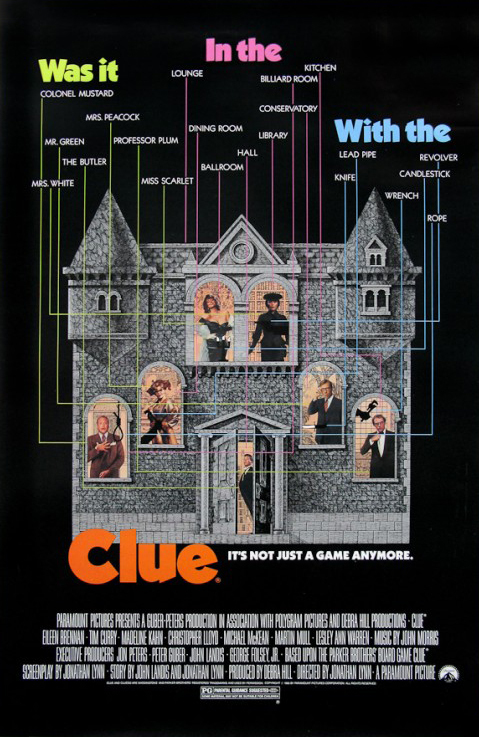 Clue is a fairly simple game but with a lot of data points, and while every single one of them are included here, none of them feel forced. There are even half a dozen extra characters added (mostly as cannon fodder) and it still somehow doesn’t feel unwieldy. I don’t think this movie will ever get old.